Four persons including three Assam Rifles personnel and a civilian were injured in a bomb blast in Imphal this evening. The blast took place when unidentified persons suspected to be member(s) of banned rebel outfit lobbed grenade at the entrance gate of Mapal Kangjeibung, the oldest living Polo ground in the world, around 6.10 pm today. 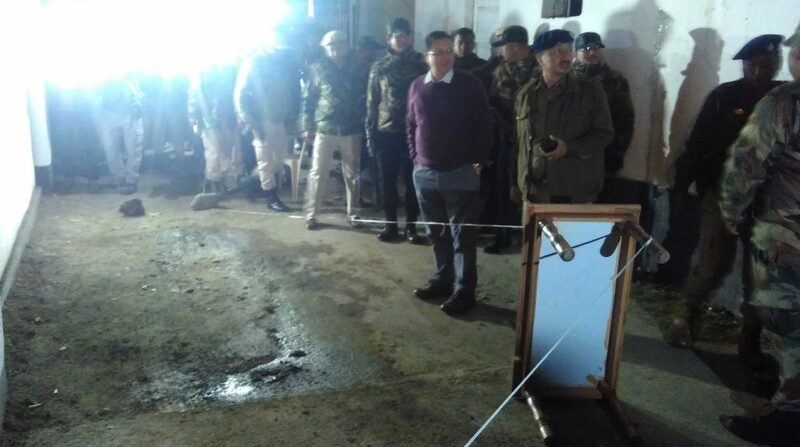 The incident occurred when the personnel of 6 Assam Rifles personnel were preparing for an annual equestrian championship which is scheduled to begin at the Polo Ground here from February 11. Meanwhile the injured personnel have been admitted to RIMS Hospital for treatment. The injured persons were hit by the splinters of the grenade. The condition of one of the injured Assam Rifles personnel is said to be serious, hospital sources said. The injured Assam Rifles personnel have been identified as Havildar BR Prajabati, 44, Havildar Chamanlal, 40, and warrant officer Beenitkumar Nath (51) while the injured civilian has been identified as Anil Kumar Shah, 30. Manipur chief minister N Biren Singh accompanied by MLAs Y Surchandra,S Bira along with DGP Manipur LM Khaute , additional DGP Santosh ,IGP Clay Khongsai SP Imphal west HJogeshchandra visited the injured persons at the hospital. Police is investigating into the incident. No armed groups operating in the state has claimed responsibility for the incident till the time of filling of this report.